A great week of car news for our readers, with the announcement of a Mercedes-AMG Petronas hypercar, a one-off Koenigsegg Agera RS, and a new Porsche Macan Turbo performance kit! A customised Agera RS known as the Naraya has been specially built for a customer. The Agera RS Naraya made its debut at the Salon Prive 2016 and was created for Blancpain GT Series driver Pasin Lathouras. The car oozes class, with a truly special finish in the form of tinted blue carbon colouring accompanied by a wealth of 24K gold leaf accents around the car. Its even got a carbon fibre tub, making it the first Koenigsegg ever to have both the exterior and tub the same colour. On the inside the colour matching continues, with blue alcantara and gold accents used throughout, reminding you of the cars uniqueness. The engine remains untouched which is hardly an issue considering the 1160 bhp available from it's 5.0-litre twin-turbo V8. 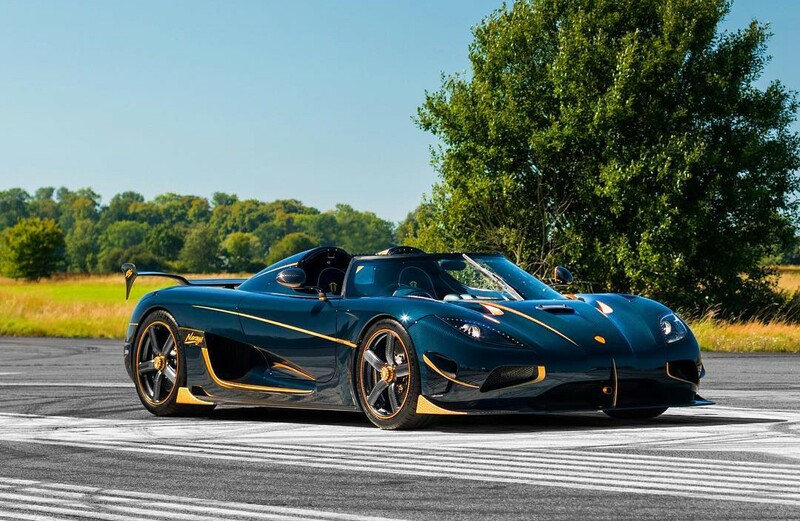 The price of the Agera RS Naraya is unknown, but with a 'normal' one setting you back over £1.5 million, you'd imagine this model is probably close to £2 million - damn! Mercedes' all-new GLC 43 Coupe will make its first public appearance at the 2016 Paris Motor Show. The GLC 43 Coupe is the AMG-equivalent of the GLC Coupe SUV, meaning more power, greater handling and steering, and a whole host of sporty upgrades and tweaks. The first is of course the engine, and as you may have guessed the '43' means the same unit as the new C43 AMG - a 3.0-litre twin-turbo V6 pushing out an impressive 362 bhp and 0-62 mph time of 4.9 seconds. Other upgrades include the nine-speed automatic gearbox, sports steering and a rear-focused 4MATCH four-wheel drive system. In terms of visible changes, there's a whole host of beefier and chunkier panels, plus new 19-inch alloys, a small spoiler and quad chrome exhausts. The GLC 43 Coupe will go on sale in December, with prices expected to be upwards of £52,000. The Porsche Macan Turbo has had an official performance upgrade released. Known as the Performance Package, it boosts the Porsche Macan's 3.6-litre twin-turbo V6 from 394 bhp to 433 bhp, thus increasing the 0-62 mph time by 0.4 seconds to just 4.4 seconds. There's also a newly developed braking system which includes larger front discs, plus a sports chassis, lowered suspension and a sports exhaust. Aesthetic changes bring new 21-inch alloys and LED headlights on the outside, whilst leather and Alcantara trim appears on the inside along with some smart carbon fibre touches. The Performance Package costs an extra £5,500 bringing the total price to just over £68,000. If you'd like one yourself, you can order it now with deliveries expected before the end of the year. An all-new Mercedes-AMG hypercar is on the way and it'll come with the help of their F1 team. An inside source within the Mercedes-AMG Petronas F1 team have told EVO.co.uk that they are working on a special hypercar to mark the 50th anniversary of AMG. Whilst details naturally remain scarce at this point, the most interesting news is that it won't be powered by a huge engine, but in fact a 1.6-litre turbo V6 taken straight from their F1 car. The engine coupled with the same F1 hybrid technology should bring the car's power to over 1,000 bhp, meaning a ludicrously fast car. You'd also imagine a four-wheel-drive system will be necessary to put the power down, as well as a custom gearbox and more. The hypercar is very much in the early stages of development, with the final stages of its design being done now with a reveal likely to be next year. The new Ford Focus RS has had an upgrade kit released by Hennessey. Hennessey are a American tuning company that specialise in upgrading sports cars, and their latest creation is the HPE400 kit for the new Ford Focus RS. Whilst a standard RS doesn't lack power with 345 bhp under the hood, the HPE400 upgrade gives it a noticeable 55 bhp increase bringing it to a punchy 400 bhp. This new power output is achieved by new parts in the shape of an uprated intake, high-flow air filter, blow-off valve and stainless steel mid-pipe for the exhaust, as well as a retuned ECU to bring it all together. The HPE400 kit costs just $2,995 (roughly £2,250), which is pretty reasonable considering the fun you're bound to get out of that near-16% power increase.